As this posts, Lord willing (insha’allah), Ariel and I’ll be winging our way towards Pittsburgh. This last month has been the adventure of a lifetime, and don’t think you’ve read the last post about it yet. But the sense that comes to the fore of my mind most readily at this point is that of relief. 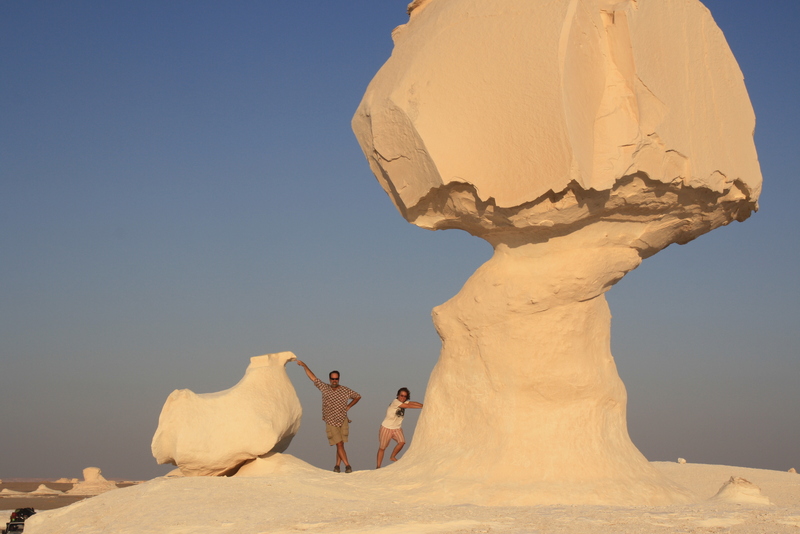 We have seen extraordinary sights. We have had amazing adventures. We have eaten…well, interesting food. We have been joined by some great new friends along the way. Yet we are not home. 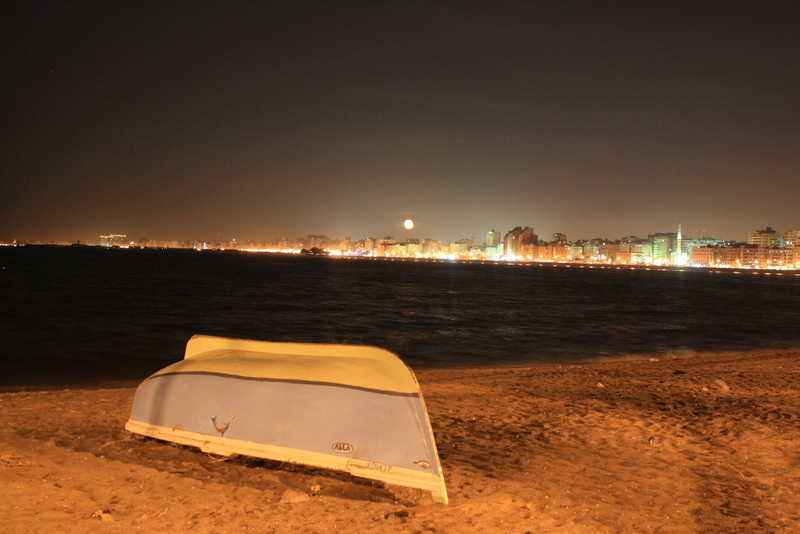 The other day, we were walking together through the city of Alexandria, on the Mediterranean coast. We were both hungry and tired, and it was so frustrating to not even be able to read the letters on the signs that jumped at us from every building. All we wanted was a restaurant, and we weren’t sure which establishments sold food and which sold auto parts or underwear. We were dis-oriented. We had lost our compass and our sense of perspective. 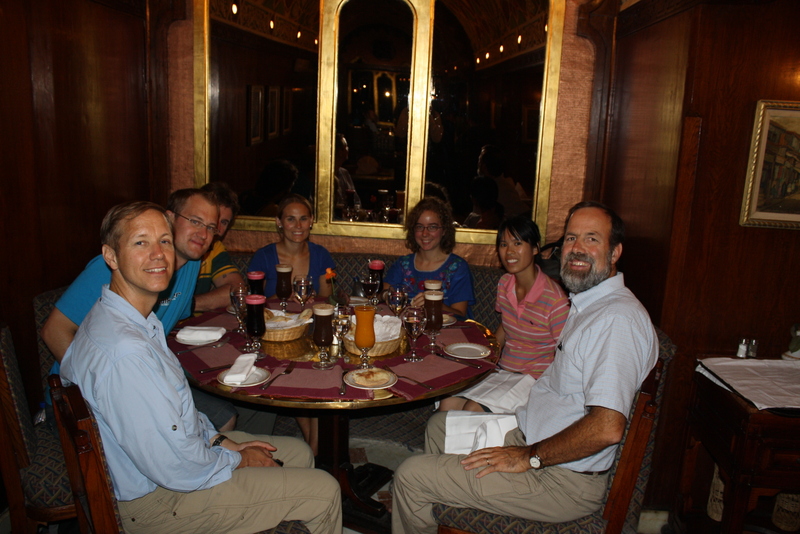 While our tour has officially ended, a few of the stalwarts had one last meal together at Khan-el Khalili. From left, you'll see Paul (US), Manuel (Germany), Tony (Australia), Lara (Canada), Ariel, Jenny (Australia) and me. So tonight, insha-allah, we will seek to begin our re-integration into the lives that the Lord has for us in the USA. We are grateful for where we have been, and excited about where we are heading. 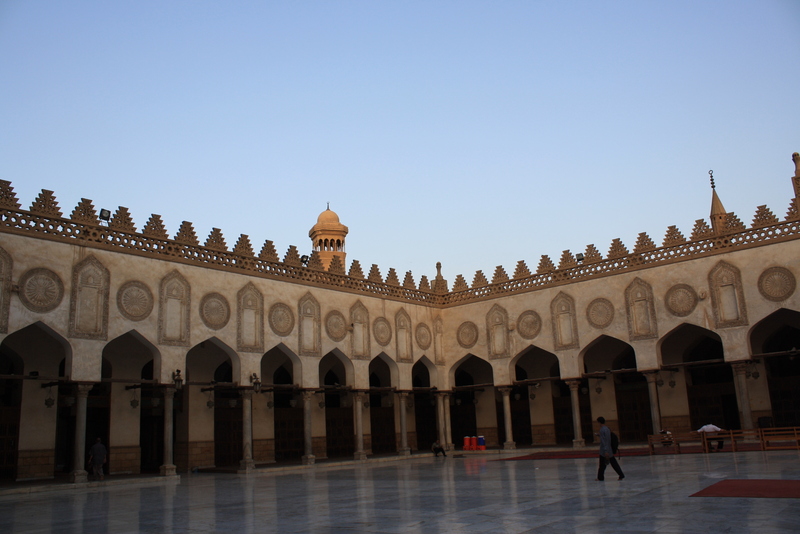 The Minarets of Al-Hazr Mosque, which dates from 970 AD. 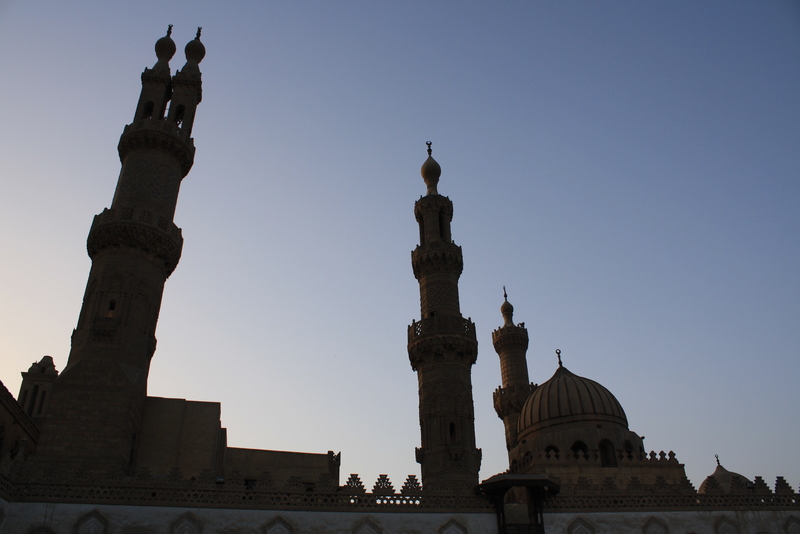 “The City of a Thousand Minarets” – that is the nickname that travelers have given Cairo for a number of years. And, as someone who has been summoned to prayer five times a day by a cacaphony of muezzim who are broadcast from the towers that surround the mosques, I’m here to say that’s not an underestimate. The YouTube video above gives you the barest hint of what it sounds like as you walk through the streets (or lay in your bed at 4:30 in the morning…). Inside the Al-Hazr Mosque. Note that Jenny and Ariel were asked to don extra robes because they had been wearing short-sleeved tops. 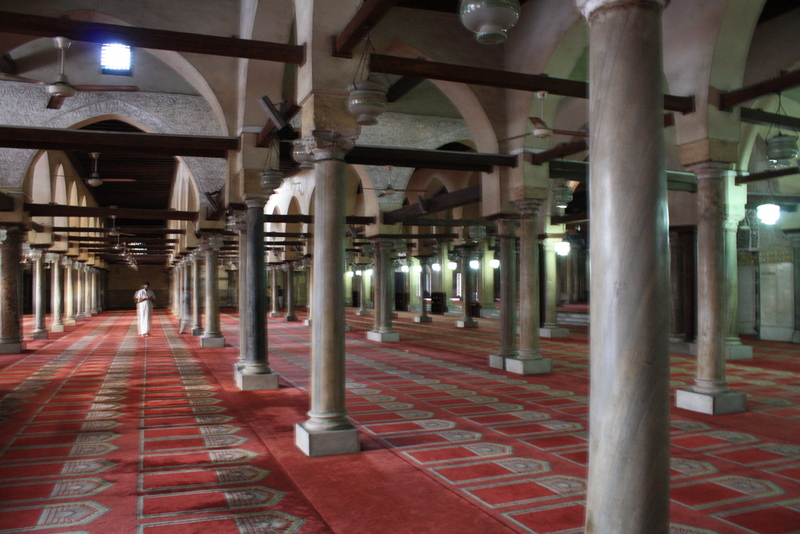 The main worship space in the Al-Hazr mosque. This facility can accomodate 12,000 worshippers. The population of Egypt is 90% Muslim, and the nation is officially an Islamic State. As our official tour of the Middle East finished on Sunday, we wanted to get a deeper glimpse into the lives of those who follow Christ in this part of the world. There are 16 denominations of Christians present here, representing 2,700 congregations (including 1050 Protestant churches, of which 312 are Presbyterian). 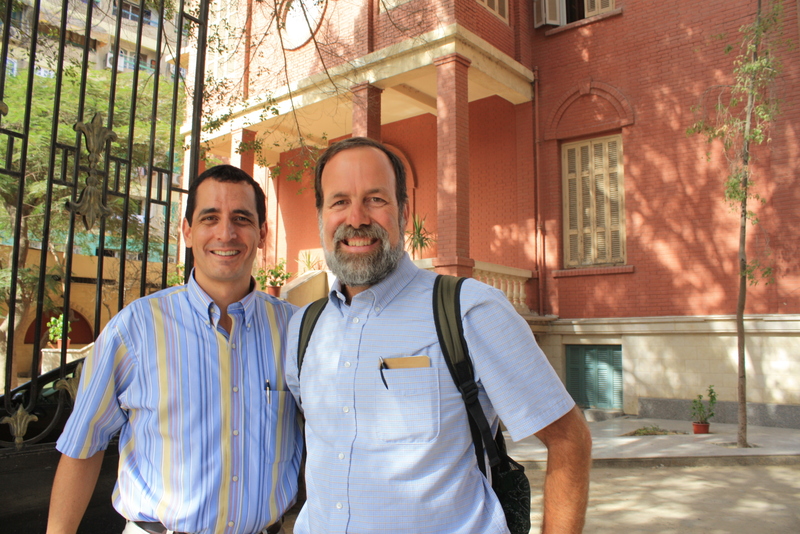 Presbyterian Missionary Dr. Darren Kennedy graciously invited us to visit the Evangelical Theological Seminary of Cairo for such a peek. To give you a sense of perspective, Egypt’s 82 million people live in 28,000 administrative districts (neighborhoods, villages, etc.). 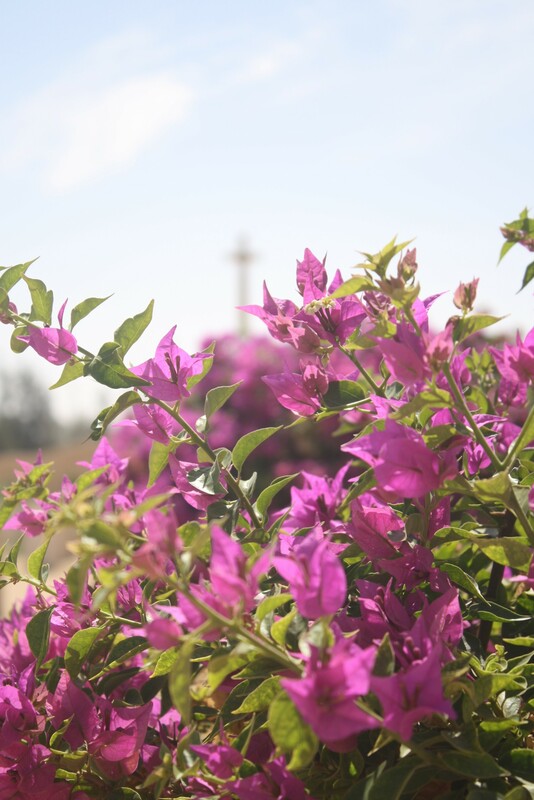 According to some startling demographic research done by one of the Seminary’s professors, the church is only present in 800 of these – which means that more than 27,000 Egyptian communities have no witness to the love and grace of Jesus Christ. The Seminary has had some astounding growth in recent years as it seeks to share the light of Christ with the communities that make up this vast land. In 1999, there were approximately 65 students, and none of the faculty members were Egyptians with their PhD’s. 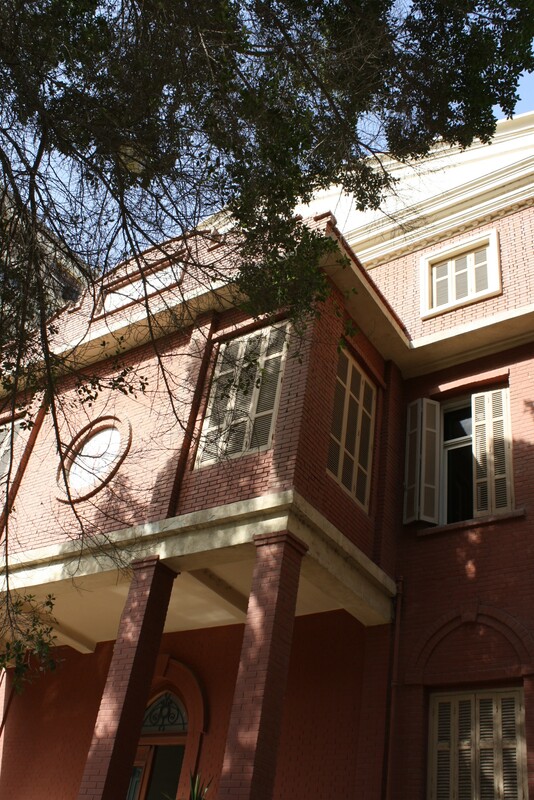 Now, a faculty including 4 Egyptians with their doctorates (as well as 3 who are pursuing that degree) tutors a student body with more than 250 students, each of whom has already earned a Bachelor’s degree. On average, 15 students graduate each year. We had the good fortune to meet with several of these energetic and faithful leaders, and were very impressed by their commitment to the Lord and to their students. A highlight of our visit was the chance to sit for half an hour with two incredibly articulate and inspiring students, George and Emir. Each of these young men has been through three years of study already and they were full of testimonies as to where they had seen the Lord at work. 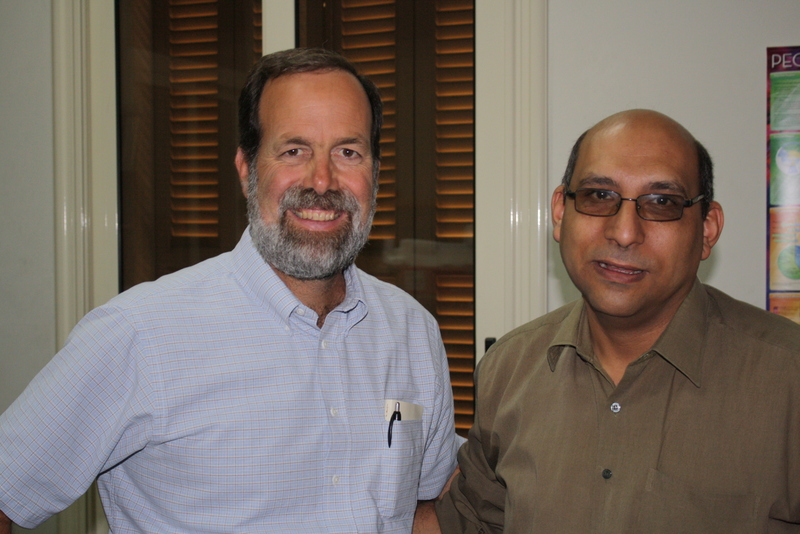 They shared some of the great challenges facing the church in Egypt: for instance, it is illegal to convert from Islam to Christianity, and it is illegal to seek to encourage anyone to do the same. While churches are legal here, it is illegal to conduct anything that looks like church business/worship/sacraments at any location other than a church building (thus constricting the ability for home Bible studies, for instance). And when a congregation wants to build, they have to get the written permission of the President of Egypt before they do. As we prayed together, I was struck by the courage and integrity of these students. It was humbling to listen to Emir’s translation of the morning’s sermon, which implored the assembly to be in prayer for the local and national leaders here in Egypt; the preacher asked those present to make it their aim to live quiet lives in which the light of God’s love in Christ could be seen plainly, all the while seeking to be a blessing to their neighbors (Christian or Islamic). It occurred to me that the believers living in this time and place face circumstances very similar to those encountered by Paul and Timothy – an Empire which was not at all interested in their ideas and was more interested in keeping things quiet and calm. More challenging and instructive than the sermon, however, was what happened next. While the message was perhaps ten minutes long, there was at least 25 minutes of prayer – prayers for President Mubarak, for the upcoming elections, for the Parliament of Egypt, for locqal authorities, and for the ability of the Church to be faithful. I commented to Darren that too often in the US it’s the other way around: a long sermon followed by a short prayer. Here, students and faculty alike prayed long and hard with each other towards the ends outlined in 1 Timothy. 1. Here in the Middle East, there is no concept of the USA as a nation with a secular government. To the contrary, people assume that the USA is a “Christian” nation, and that the things that our government does are done in and for the cause of Christ. When I understood that, I understood why so many Muslims interpret the wars in Iraq and Afghanistan as a Christian attack on Islam. 2. I was challenged as a pastor as to how I live the verses in 1 Timothy. Do I pray for the leaders of our nation, and encourage my church to do the same? So often we in the USA tiptoe around this, lest we appear “too Republican” or “too Democratic” to the politically-sensitive people in our congregations. Yet we are bound to pray for all the leaders, and I hope to be better at this in the future. I’m still thinking on that one. 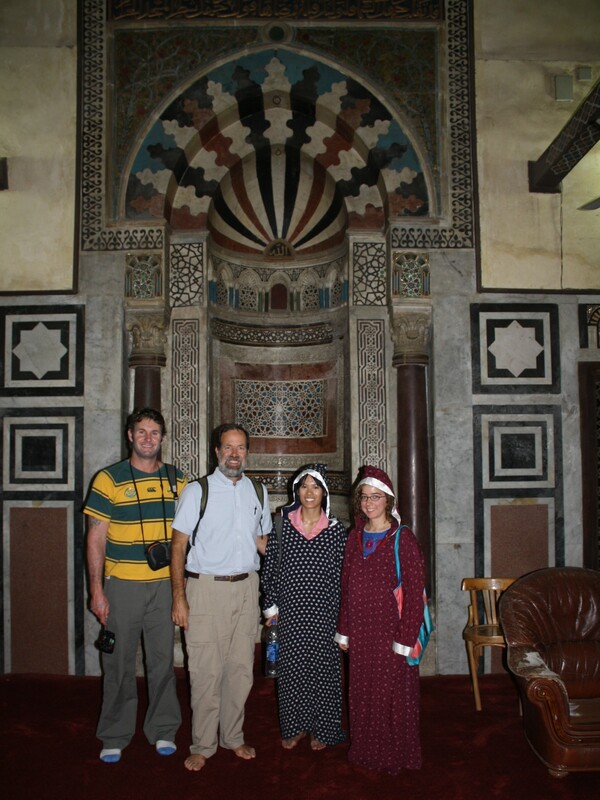 You know, the entire time we’ve been in Egypt, we’ve been wandering around inside of tombs. We’ve been in the pyramids. 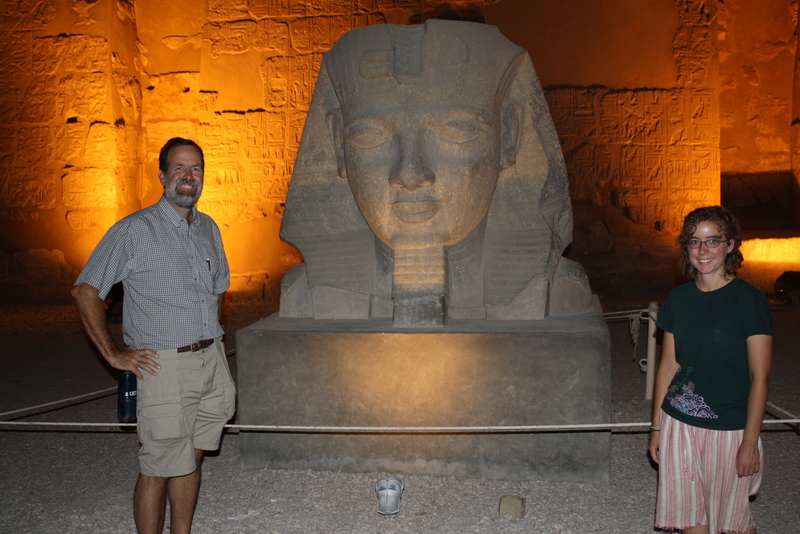 We’ve seen the “Valley of the Kings” and the “Valley of the Queens”, the “Tombs of the Workers”, and even some catacombs. You can safely say that Ariel and I have wandered around a lot of places that have been filled with dead people at one time or another. Yet on Friday, I was caught short by my reaction to a visit to another place remembering the dead. 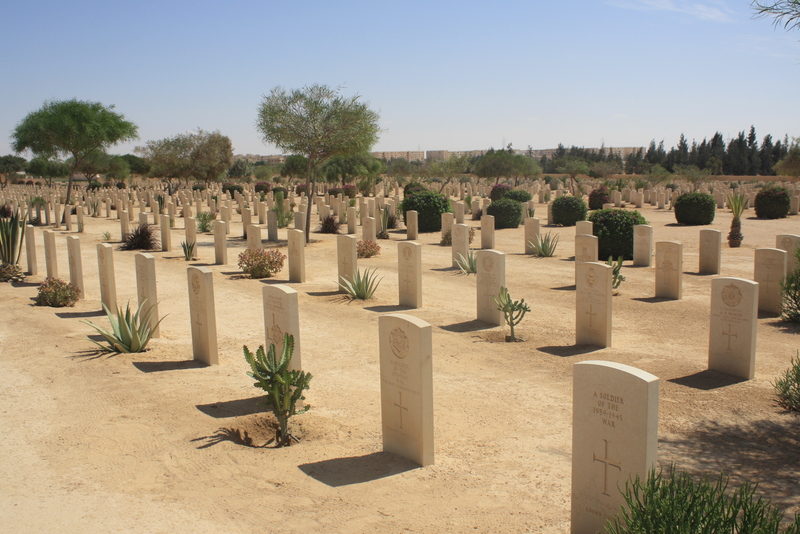 We stopped by the Military Museum and the Commonwealth War Cemetery at El Alamein, Egypt. The battle of El Alamein was the culmination of a series of conflicts that was fought across Northern Africa for the second half of 1942. It was a significant victory for the Allies – perhaps the first that was accomplished without American aid. Winston Churchill said of Montgomery’s defeat of Rommel, “Now this is not the end. It is not even the beginning of the end, but it is, perhaps, the end of the beginning.” He also wrote “Before Alamein we never had a victory. After Alamein, we never had a defeat.” It was a tremendously decisive battle for the Allies as it denied Hitler and Mossolini access to the Suez Canal. 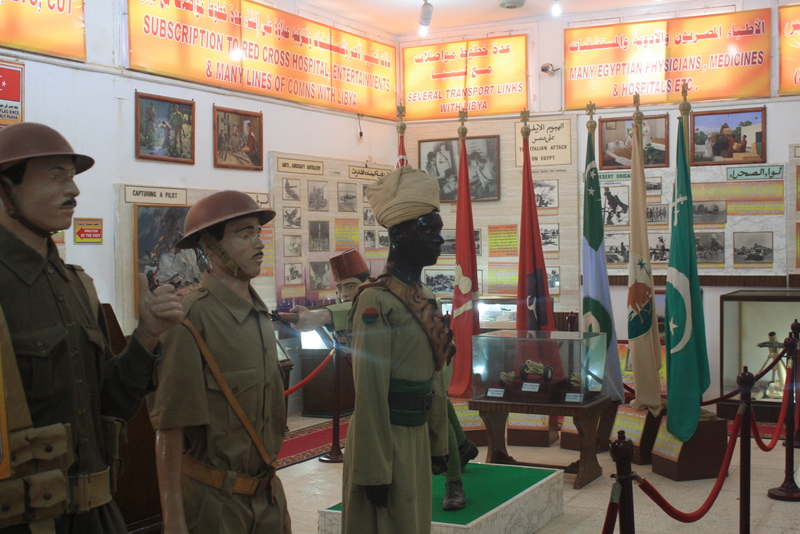 The Museum is an interesting one, because it has a room dedicated to the participants from each country: there is an Italian room, a German room, an Egyptian room, and a Commonwealth room (highlighting not only Great Britain, but also Australia, New Zealand, South Africa, Canada, and other nations within the British Commonwealth). Stories are told in English, Arabic, Italian, and German. It is an interesting museum, because it’s not built by either the victors or the defeated – it’s just telling the story. However, it was not the size or scope of the battle, or even the museum that got to me. It was wandering around the Commonwealth War Cemetery. And I wept. In fact, I made the tour bus late because I didn’t want to get on the bus while I was crying. Understand this, my friends: I was not necessarily weeping for the men and boys who were buried in these sands sixty years ago…That was a terrible battle, and I cannot imagine the horrors that they faced, nor the families that they left behind on five continents. How long, Lord? How long will you tolerate the folly of your children? Why do we seek to do such violence to each other? I saw the names on the headstones, and I prayed for the people I know who are wearing uniforms, and I prayed for the people I don’t know. I prayed for the people who think that they have the power to decide the fate of nations, and I prayed for the mercy of Christ to come pouring out like a river. In a few hours, I’ll visit the famed Library of Alexandria. The original edifice was destroyed in an earthquake in 27 BC. It was one of the Seven Wonders of the Ancient World. I’m keen to see this one because there is a room dedicated to the late Anwar Sadat – the “man of war, man of peace” who broke ranks with the Arab nations and moved, with the US and Israel, towards some sort of peace in the Middle East. As you may know, he was assassinated by his own bodyguards – angry because he spoke of peace. He was a hero to me…he is a hero to me. Where are the Sadats, the Mandelas, the Romeros of the Middle East today? Who will help us move towards peace? Who will guide the nations so that all the graves are filled by those who die of old age? Interspersed amongst the graves at the Commonwealth War Cemetery are shockingly beautiful bouganvilla plants. When you think of an “oasis”, what comes to your mind? 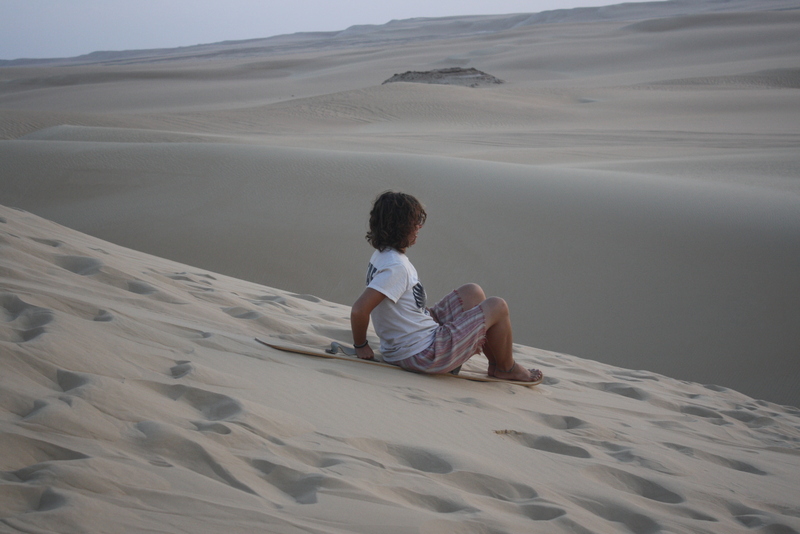 Is it something like this – a lone palm tree, a small pool of water, and maybe a couple of camels thrown in to boot? How much more "deserty" can you get? 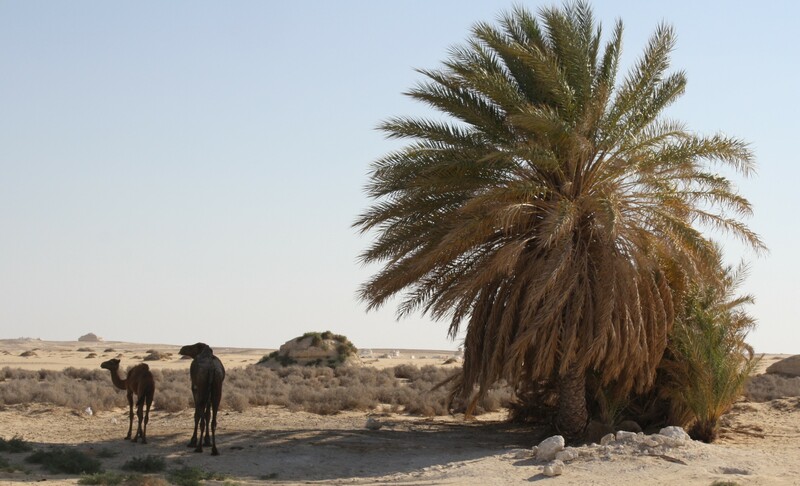 A pair of apparently wild camels under a palm tree in the midst of the Sahara? Really? I have to tell you, that’s what I thought. Even when I read our tour itinerary, and saw that we’d be staying at an oasis, I figured that we’d just camp out with the camels and take turns with the water. You can imagine my surprise, then, when the oases in which we stayed turned out to be bustling communities in the wilderness of the desert! As mentioned in the previous post, they are scattered through the barren landscape – but they are sizeable and significant towns, at the center of which, of course, is life-giving water. 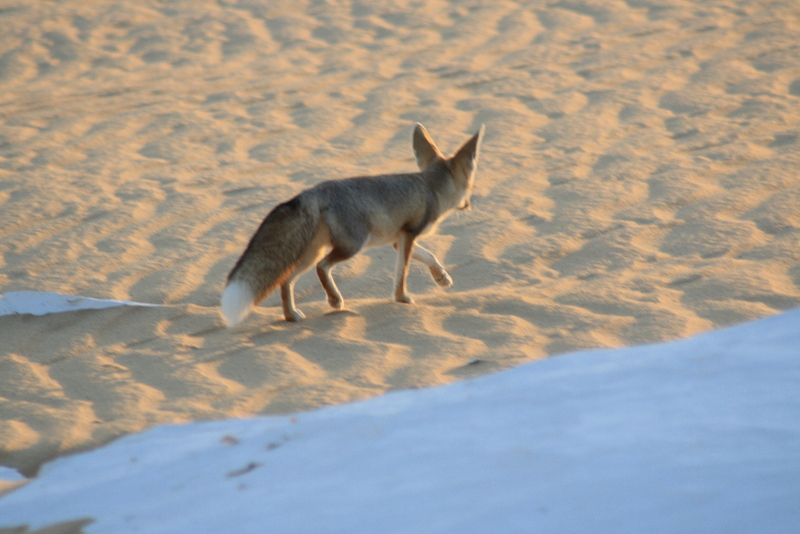 While we stayed in several Oases on our tour of Egypt’s Western Desert (so called because it’s on the west side of the Nile – it is the eastern fringe of the Sahara), our favorite place was Siwa Oasis. 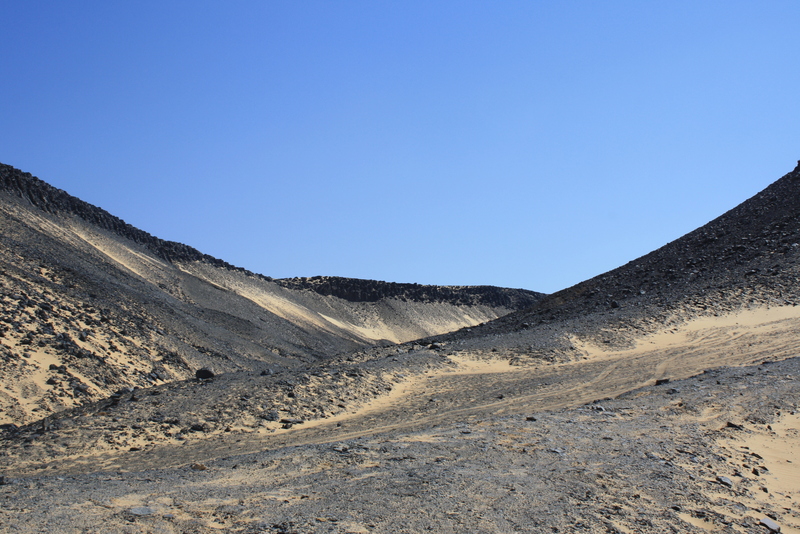 This garden in the midst of the desert is about 80 kilometers (35 miles) by 12 kilometers (5 miles). It’s home to — get this — 25,000 people, 75,000 olive trees, and 300,000 date palm trees. 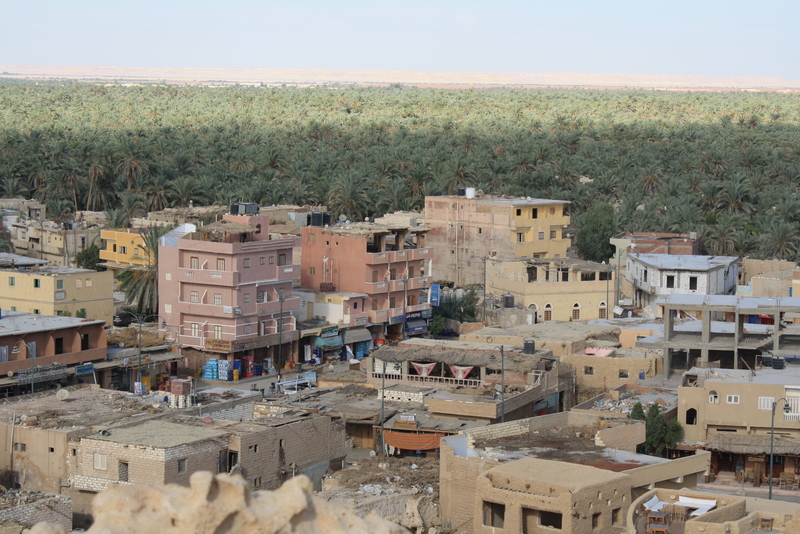 The locals in Egypt say that the olives and dates from Siwa are the best and sweetest in Egypt – and I am not arguing with them. 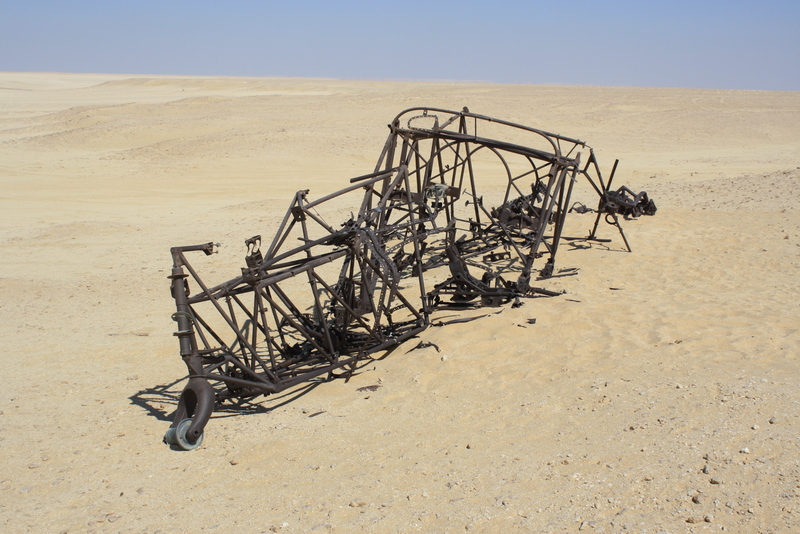 According to The Lonely Planet, the donkeys in Siwa outnumber the combustion engines, and life is verrrrry relaxed. 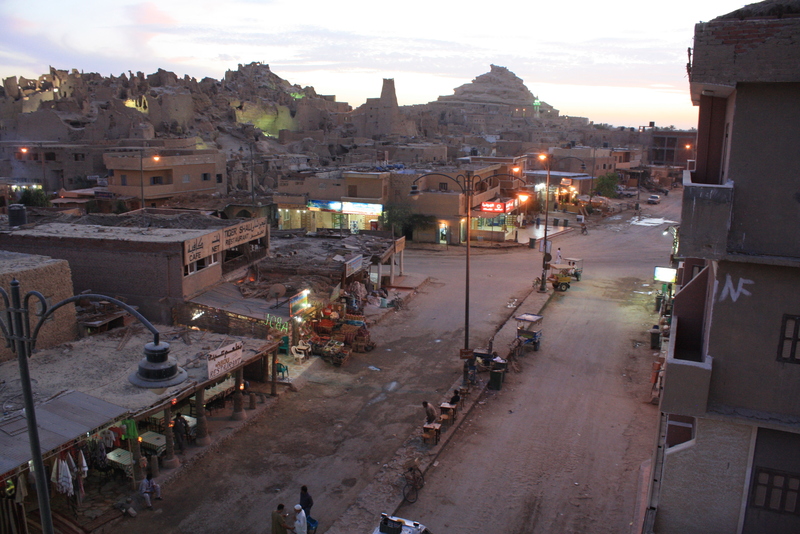 One of the "main drags" in Siwa from our hotel balcony. While there, we experienced all kinds of surprises and joys. As we did on the previous day, we took a four wheel drive safari, wherein we raced up and down sand dunes at an incredible angle. I had a great view, several times, of what I thought would surely be my own death. But it was so fun – the shrieks of laughter and terror outdid anything I’ve ever heard at Kennywood! 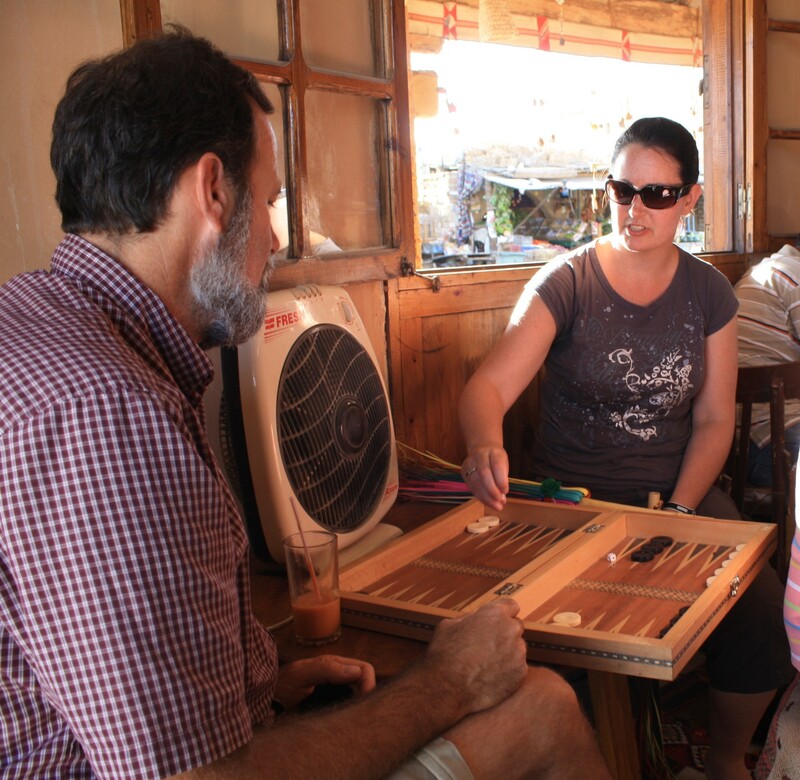 A friendly little game of Backgammon with Kelly down at Mustafa's Coffee Shop. During the hottest parts of the day, and in the evening, we hung out at a little coffee shop called “Mustafa’s”, where Mustafa himself served us fruit slushees to die for. The service wasn’t fast…OK, it took 45 minutes to get a drink, but hey, what’s the rush? And besides, there was entertainment to be had. The place was stocked with all sorts of games, and the Bob Dylan and Rolling Stones kept coming out of his state-of-the-art sound system (the man didn’t have a bug killer or a flyswatter, but I’m here to tell you that the place sounded great!). We had the chance to bike around town, and to visit several of the cool, clear springs that underlie the entire operation. The temperature was 107 degrees, yet the water was probably only 75 or 80. Amazingly refreshing! 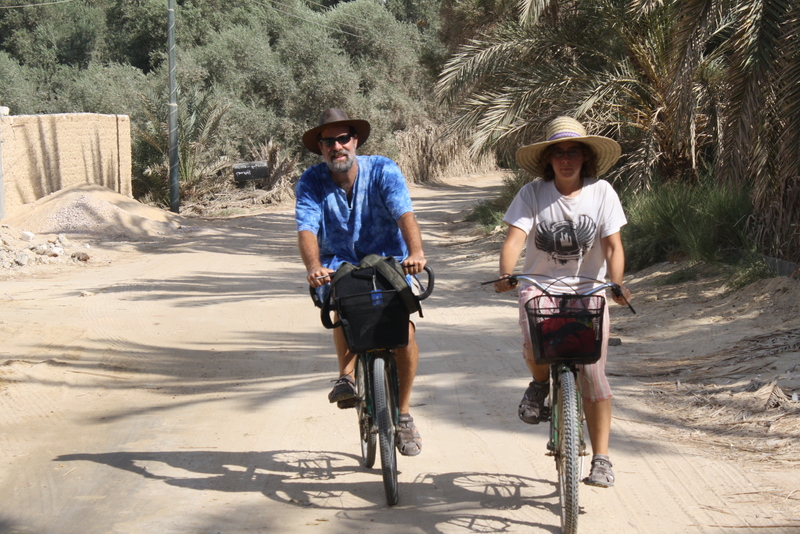 A little bike tour of Siwa Oasis. It's how we got around town! 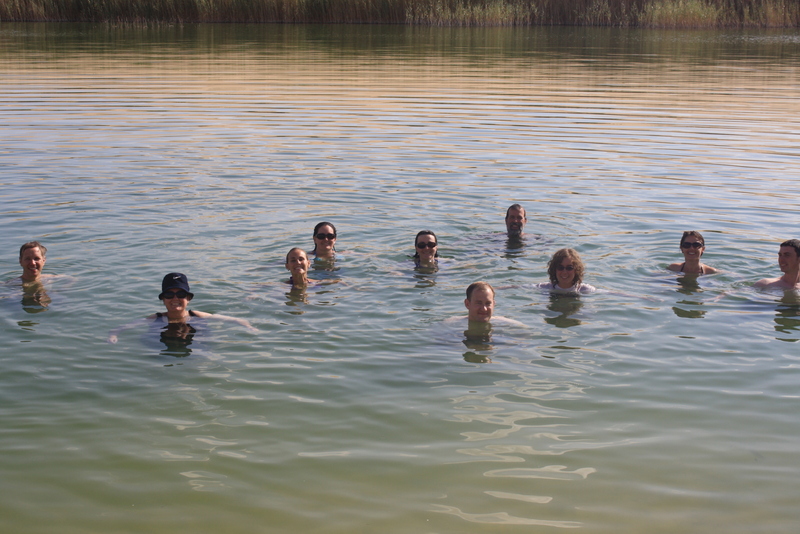 Most of our Intrepid Travelers down at the cool springs near Siwa. If you'd have told me I needed my fishing pole in the desert, I'd have said you were lying! One of my goals each summer is to introduce someone to the joys of fishing. 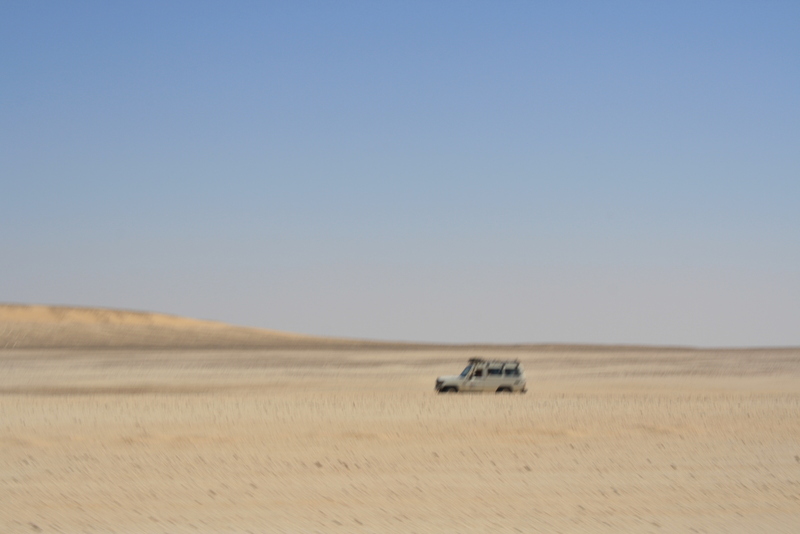 What a kick it was to teach my friend and guide Ahmed how to fish…in the middle of the Sahara desert…and he caught two! Many of these pools were home to a variety of cichlid that seemed to go between two and eight inches. Not worth keeping, but fun to catch! As I reflected on the harshness of the desert and the wonders of the oasis, I thought about two scripture passages. While doing all of this reflecting, I have been reading a book entitled Glimpses of Glory Dave and Neta Jackson. It is an account of the first thirty years of Reba Place Fellowship, the group with whom Ariel will be doing her apprenticeship come October. In it, the Jacksons talk about the wonder of community and the joy of relationship, and say that while Reba Place misses the mark on many occasions, they can see “glimpses of glory” every now and then – and those glimpses provide the community with the incentive to keep on trying, to keep on growing. I wonder if maybe that’s what the Lord had in mind when he created oases and used that imagery to talk about the promises of his reign and rule among us. For so many of the Israelites, life was hard, hot, and dry. The desert was the norm. 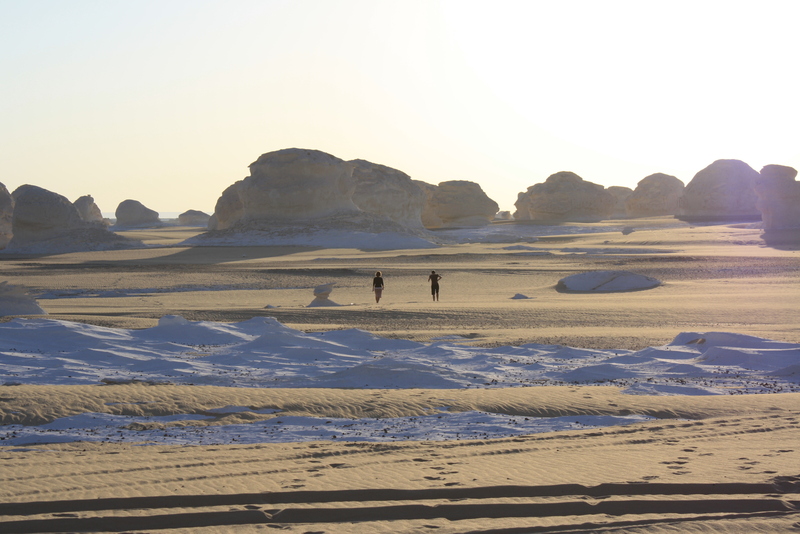 But every now and then, they would stumble upon a place like Siwa and then – THEN – they could get a glimpse of what God’s intentions were all about. 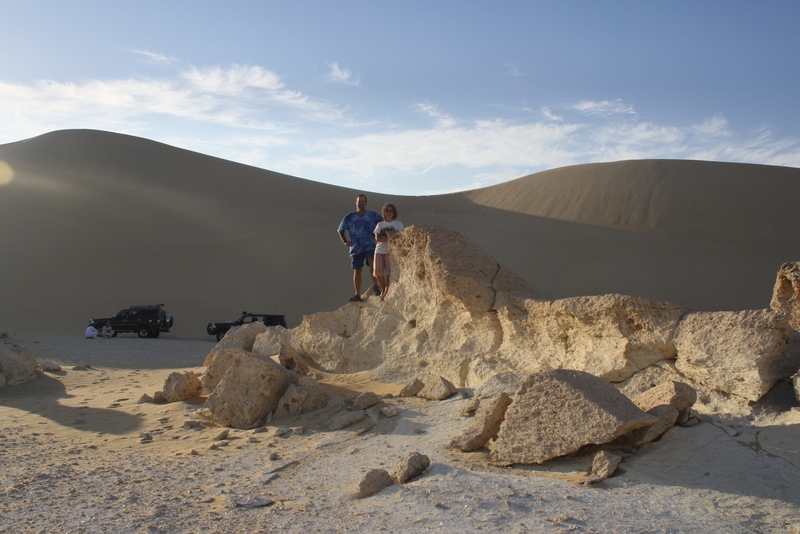 Oases are definitely NOT the norm in this part of the world, yet they clearly show that such a reality is possible and does exist. 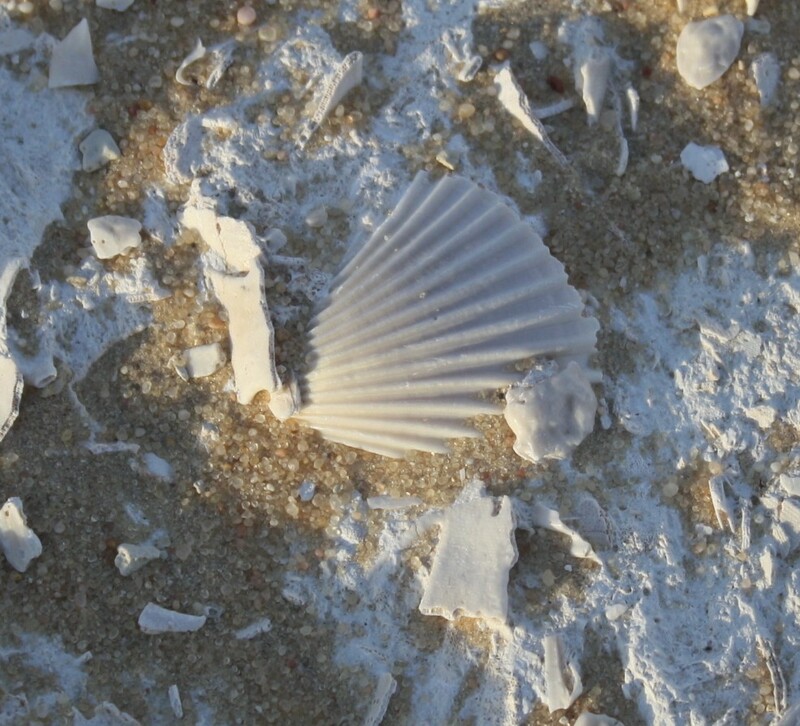 Fossilized sea shells cover the floor of many parts of the desert. Can you believe it? All around me – seashells!!! Glimpses of glory in the midst of the desert. As we left Siwa this morning, I asked the folks in our van to come up with some words that would describe the trip in and out of the oasis. After all, it took three hours of driving to get to the nearest sign of human life after we left. We came up with these words: tedious, boring, unchanging, empty, and mind-numbing. I don’t know how the driver stayed awake – straight and flat and not a living creature (plant or animal) in sight. Look at those words again: tedious, boring, unchanging, empty, and mind-numbing. Now, think about the people you see on a daily basis. Do you think that some of those folks might use those words to describe their own lives? 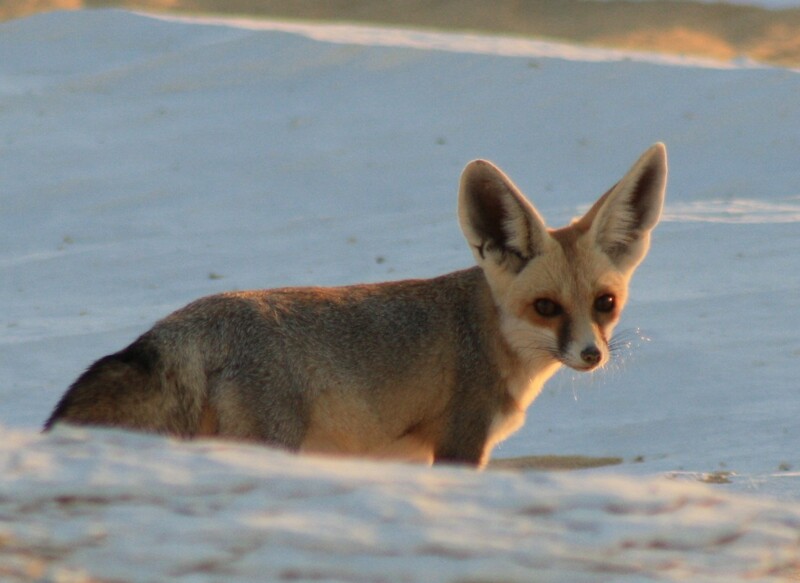 Don’t many of the people we know seem to exist in a desert (perhaps of their own choosing)? I wonder…what if God intends each of us – His people – to be like an oasis in the midst of their lives? What if each of us – not all the time, but sometimes, anyway – could be a reminder of the fact that there is more to this life than meets the eye? What if we lived in such a way that indicated that there are seashells in the desert, and that there are cool springs under the sand, and that the scenery we’ve encountered the last three hours isn’t the way it always is? What if each of us lived as though we were a “glimpse of glory”? What if we shared the light we’ve been given and in so doing, encouraged our friends and neighbors and co-workers to think about the way that life could be – and about the healing and resurrecting that God longs to do? What would that be like? I think it would be like fishing in the desert. Awesome. Magnificent. Fabulous. Grab your rod. I’ve got something to show you! Ariel gives sandboarding a try - she had an awesome ride! 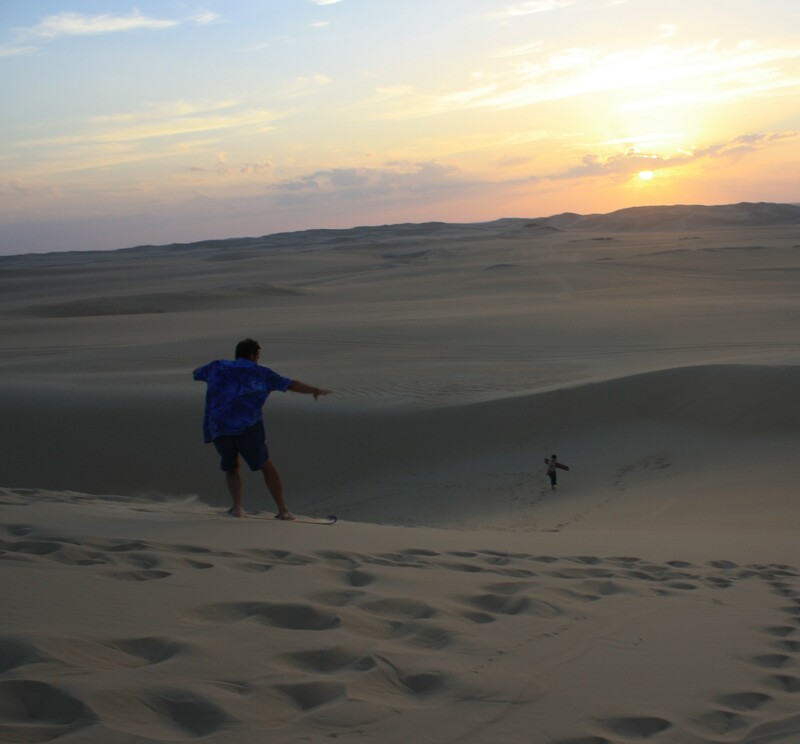 That's me, sandboarding in the desert at sunset. I guess I'm pretty good - I made it down both times without a face plant! Egypt: Brought to You By I.B.M. When we arrived in this country, our guide taught us three words that he said would be indispensable in our understanding of this culture. In the last week and a half, we have come to see the truth in that. The second word that has proven to be prophetic is Bokra, meaning “tomorrow”. 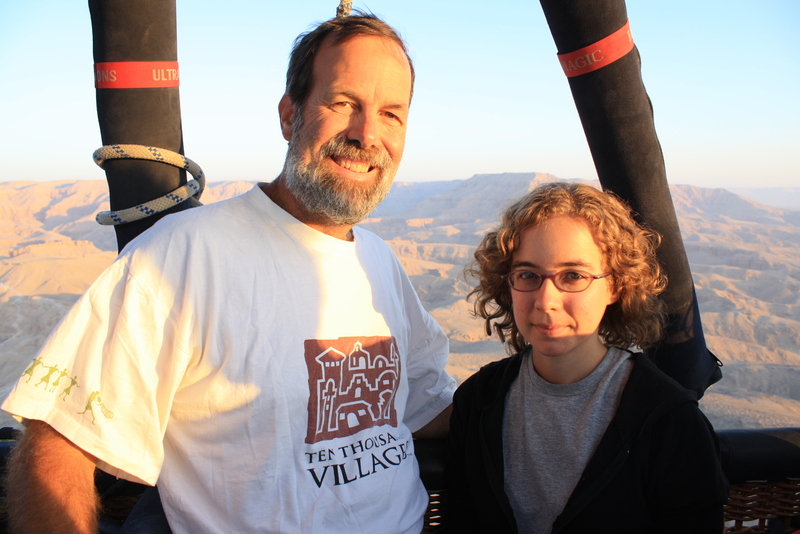 On Saturday, for instance, we were supposed to take a hot air balloon ride. It was windy. 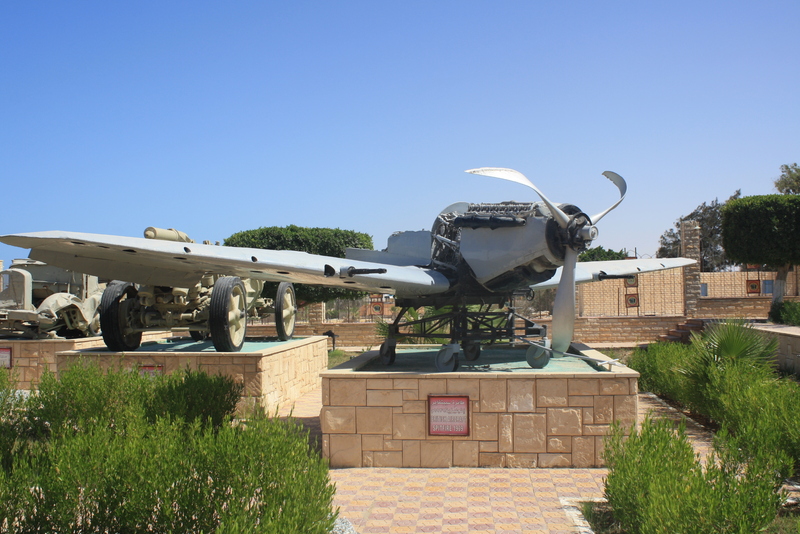 “Bokra“, the pilot said. “Insh’Allah.” Yeah, for sure. The second try was a charm! Got off in time for sunrise over the Valley of the Kings. I’m convinced that it rules Egypt most days. Not that that’s always a bad thing…but it sure does make me re-think my westernized ideas! 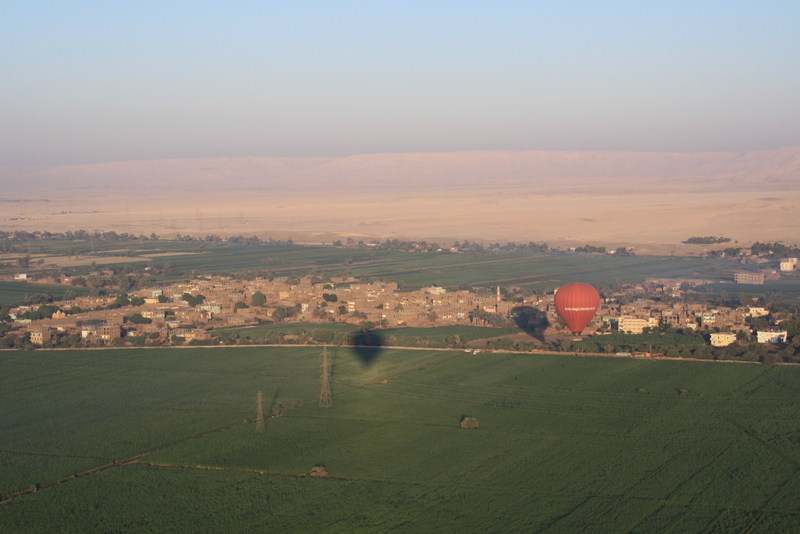 This shot from our balloon shows the radical distinction between the desert that encompasses most of Egypt and the lush valley that snakes along the Nile. OK, maybe Eat N Park isn’t your place, but I know that somewhere, sometime, you have bellied up to a buffet at some restaurant and thought, “Wow…there’s so much food and so little belly in which to squeeze it.” You know, there are just more things to eat than there is time and energy to eat it. If you know that feeling, then you know how Ariel and felt when we were given a full day and a half to explore Luxor, Egypt. Luxor, as our guide was quick to point out, is home to 1/3 of all of the monuments in the entire world. Again, there may be some who might want to argue that statistic, but the same guide says that it’s home to half of all the monuments in Egypt. The temples, statues, tombs, and monuments grow like weeds here in this ancient city which, when known as Thebes, ruled not only Egypt, but the world. We focused our time and energy on a few places: the Temple of Edfu, the second-largest temple in Egypt and one of the most well-preserved. It’s dedicated to the god Horus, who has the body of a man and the head of a falcon. 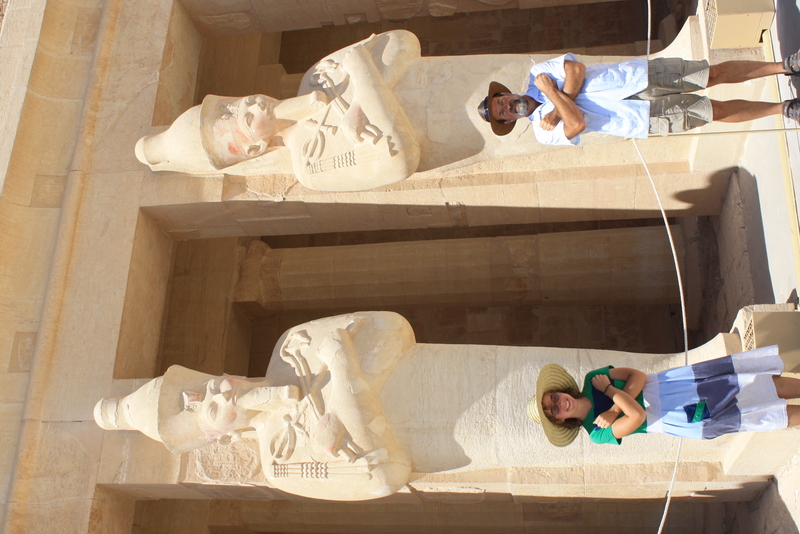 We also spent time at the great temple of Karnak, considered to be the largest religious structure ever built. It was built to honor the god Amun and establish his primacy in Egyptian mythology. The great Temple of Luxor is connected to the Karnak temple and was used for a variety of experiences. We enjoyed seeing it as it is one of the few edifices open after dark (and thus enjoyable when the heat of the sun is at least diminished – it is about 100 degrees every day, and not a whisper of a cloud. We also enjoyed visiting the Valley of the Kings (no photos allowed! ), the Burial Temple of Hatshepsut, and the Tombs of the Workers who were charged, for 400 years, with carving out the tombs that comprise the “City of the Dead” that is on the west bank of the Nile River. We can either lament the fact that we couldn’t see it all…or savor the opportunity to have seen some of it. To that end, we share some images in the hopes that you will celebrate with us this opportunity of a lifetime. 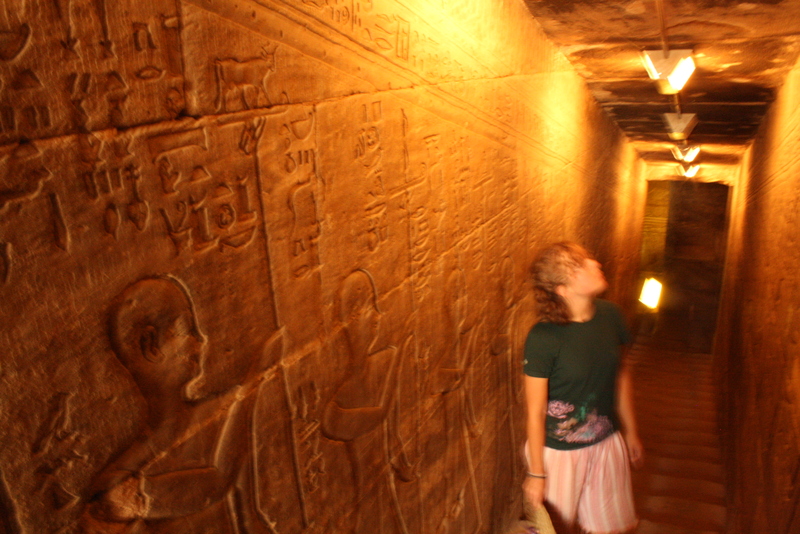 Ariel examines a wall of hieroglyphics at the Temple of Edfu. We couldn't get the plaza of Edfu temple in one shot. It's huge! 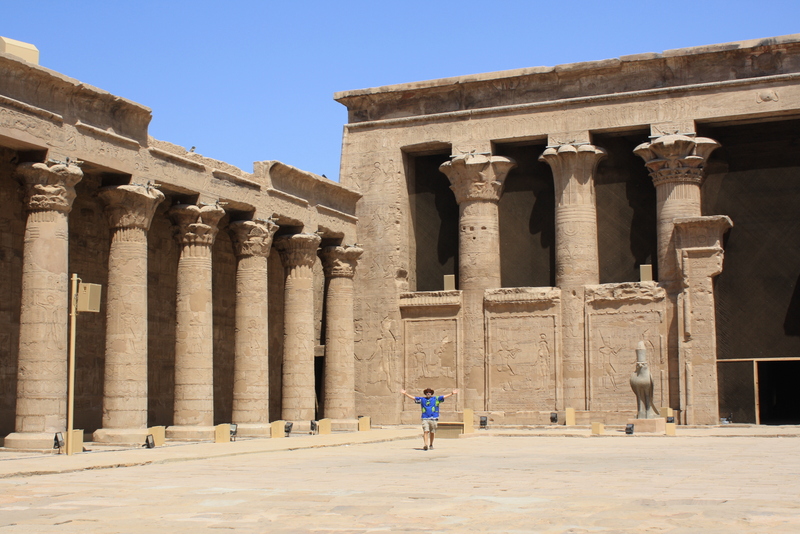 Well, it looks like Ramses II wasn't content with building the Temple of Luxor, he wanted to make it onto the Blog, too! Congratulations, Big Guy! So there’s one more story, at least, from Luxor. The preamble: “fast” and “food” do not go together in this culture. At all. It has taken an hour or more from the time we order to the time we see our first food in most places. So on Saturday, the group of us was sitting in the New Mish Mish cafe, waiting for our schewerma to come, and we saw a horse-drawn cart parked outside for at least half an hour. 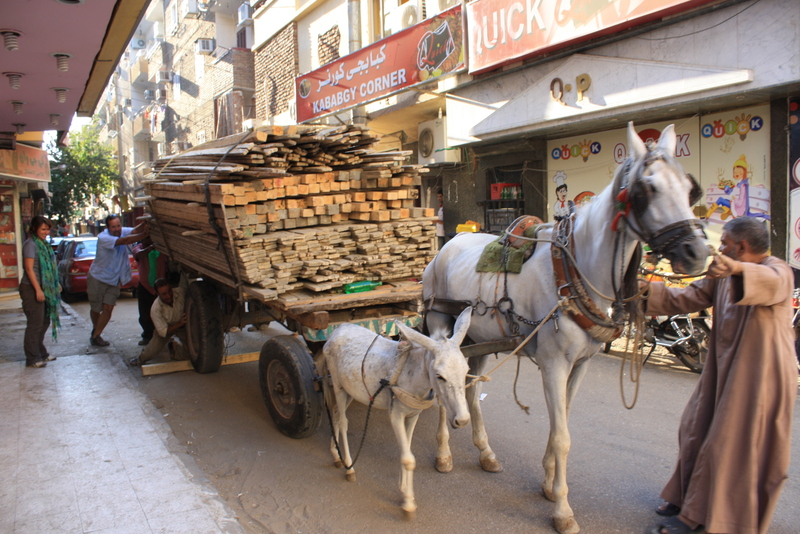 We wondered why in the world this cart, pulled by a large draft horse and a diminutive donkey, would be parked in the middle of the street. Finally, I noticed that the team had gotten the first wheel of the cart over a speed bump in the road, but then it had to stop and the beasts simply were unable to either pull it forward or back it up. There was a stack of timber on this cart at least six feet high. So we decided to lend some international aid to the situation. The cart driver was surprised when a couple Americans, several Australians, a Canadian and a German trooped out of the restaurant and got behind the cart and pushed. I don’t know how happy the horse and mule were, but the merchant was thrilled to be on his way again…and we got a story to tell. This Mutt and Jeff team with its wagon was blocking traffic for half an hour until we helped them over a bump in the road. Score one for International friendships! Here’s hoping you have a story or two of your own today!